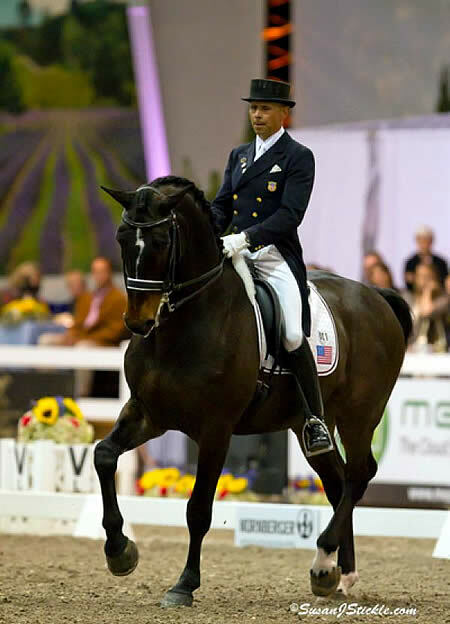 Wellington, FL – November 10, 2011 – Totilas, the reigning Dressage World Champion and current world record holder in the Grand Prix Freestyle, is coming to the 2012 World Dressage Masters Palm Beach presented by International Polo Club Palm Beach. His appearance at the prestigious WDM CDI5*’s only event in North America, at the Jim Brandon Equestrian Center on January 26 to 29, 2012. This will be the ONLY public appearance of this legendary stallion during his visit to North America. The WDM Palm Beach CDI5* will run concurrently with the Wellington Classic Sunshine Challenge CDI3*/CPEI3*. 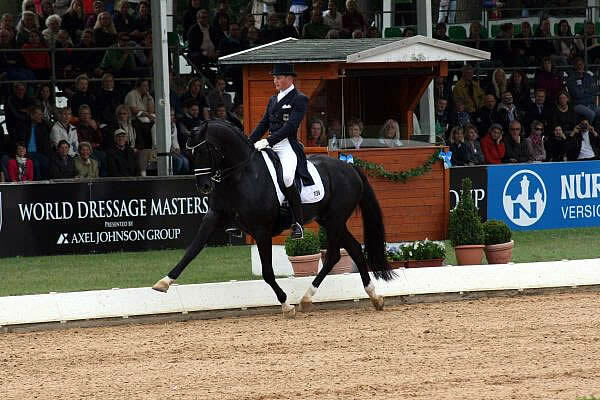 The World Dressage Masters CDI5* presented by Axel Johnson Group is the world’s premier dressage series, with over half a million dollars in prize money, and each show boasts over 100,000 Euros in prize money. With his current rider, Germany’s Matthias Alexander Rath, Totilas won the CHIO Aachen 2011 in July; Totilas and Rath went on to help the German Team win a silver medal at the European Dressage Championships in August. The WDM Palm Beach will launch Rath’s and Totilas 2012 competition season, which is directed towards the London 2012 Olympics. Totilas is an 11 year old KWPN stallion co-owned by renowned German Olympic Show Jumper and breeder Paul Schockemöhle and German Olympic Dressage rider Ann-Katrin Linsenhof. Wellington Classic Dressage is the organizer of the WDM Palm Beach, having taken over the reins of this unique event in 2011. Managing Partner Noreen O’Sullivan says excitement is building around an already star-studded list of confirmed entries. “The word is out to the top riders in the world, who are making their plans and looking to Wellington Classic Dressage and the WDM Palm Beach for an exciting winter season in Florida,” she says. O’Sullivan has confirmed that the reigning WDM Palm Beach Champions Steffen Peters and Ravel will be returning to Florida to defend their title. Ravel is a 13 year old KWPN gelding owned by WDM Palm Beach sponsor Akiko Yamazaki. The only time Ravel and Totilas have competed against one another with their current riders was at the CHIO Aachen 2011, where Totilas narrowly defeated Ravel in the Grand Prix Freestyle. O’Sullivan has also confirmed several other top international pairs for the WDM Palm Beach 2012, including reigning Olympic Champions Anky van Grunsven and Salinero, as well as the 2011 European Team Champions from Great Britain, Carl Hester and Charlotte Dujardin, who will bring her European Championship mount, Valegro. Making a return visit to the WDM Palm Beach will be the second and third placed pairs from the WDM Palm Beach 2011: Tinne Vilhelmsson Silfven of Sweden on Favourit and Tina Konyot of the US with Calecto V.
Over the coming weeks, there will be announcements about more top international entries for the WDM Palm Beach, as well as information about tickets for VIP table seating and General Admission. “We are planning an expanded General Admission Area, up-scale vendors for food and shopping, entertainment, and of course, some great competition,” says O’Sullivan. The WDM Palm Beach 2011 was a spectacular success, and a memorable evening for over 1200 spectators who were treated to a multi-course French themed dinner at ringside. The WDM Palm Beach 2012 is expected to be the dressage event of the season in South Florida. What: North America’s only World Dressage Masters CDI5*, and part of the richest dressage series in the world. Up to twenty of the world’s top dressage stars will compete for 100,000 Euros in prize money at the WDM Palm Beach. Where: Jim Brandon Equestrian Center – Okeeheelee Park South, 7500 Forest Hill Blvd. Producer: Wellington Classic Dressage – www.wellingtonclassicdressage.com – Noreen O’Sullivan 561-227-1570 or John Flanagan 561-714-9058. Past WDM results, as well as complete WDM Rider Rankings can also be found on the WDM website: www.WorldDressageMasters.com.